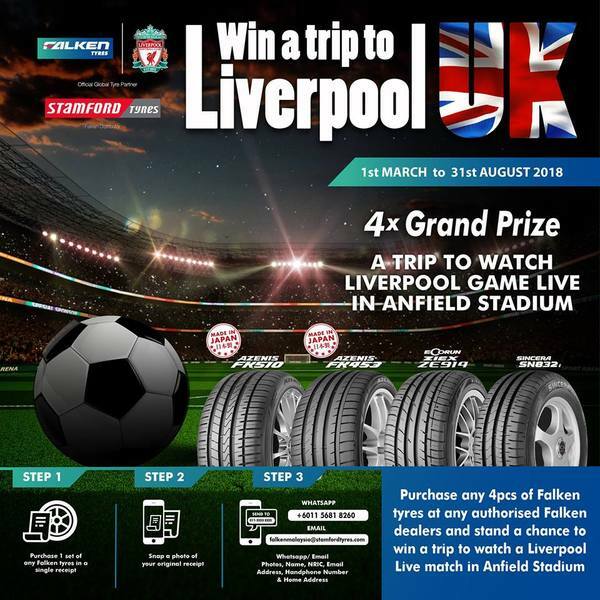 Purchase 1 set of Falken tyre and stand a chance to win a trip to Liverpool and watch Liverpool FC Match Live in Anfield Stadium! Purchase 1 set (4pcs) of Falken tyres at any authorised Falken dealers in a single receipt. Snap a photo of your original purchase receipt. Send the photo and your details; Name, NRIC, Email, Handphone Number & Home Address to our Whatsapp (+6011-5681 8260) or our email falkenmalaysia@stamfordtyres.com.